Wat Kao Hua Jook can be seen from the window of your plane at some point in the landing or taxiing into the airport terminal. It looks like a big golden bell atop a lush green hill. Not a hugely popular temple for tourists, as it is not sign posted, and unless you are in or on a vehicle the 90 metre walk straight up hill can be a bit too much on a hot Samui day. We'd recommend a visit even if you do have to do it on foot, it's worth it for the superb 360 degree views from the coastline to interior. The major scoop is getting the bird's eye view of Samui International Airport. There's not too many places in the world where you are virtually above the entire runway and can witness the full take off and landing of planes. The temple is a lovely peaceful place, with lots of seated areas to sit and enjoy watching the planes coming in and going out with a nice cup of freshly ground coffee. That's right, some of the best coffee you'll find on Samui. One of the best times to visit is sunset, spectacular! 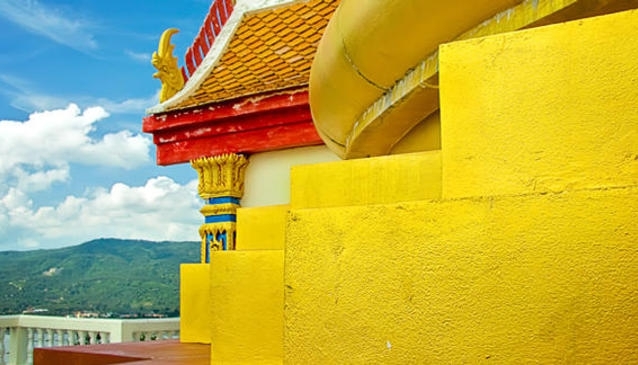 The temple can be found off the road that connects the ring road to Chaweng Beach road, at the back of the northern end of Chaweng Lake. Follow the signs to the Q Bar, and take the turn off next to Nova Samui Resort.